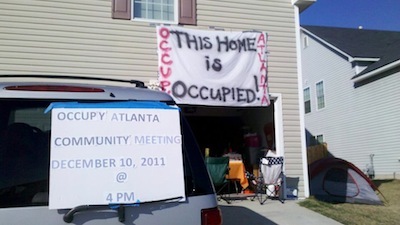 An occupied home in Atlanta. Source: Occupy Our Homes. It may seem completely spontaneous, but the Occupy movement did not come from nowhere. It has deep roots in longtime efforts to combat injustice, often at the urban level. As the Occupy movement in the U.S. moves toward 2012, this podcast looks back to the urban roots of the movement — in particular the role of community-based organizations and coalitions. It also explores the movement’s newest manifestations, including Occupy Our Homes and Occupy the ‘Hood. Hosted by Alex Schafran. Recorded via Skype, pardon the odd beep and ding. CoLab Radio brings you this Polis Podcast on CoLab Radio with our partners at Polis. Our goal is to offer a stimulating series of discussions, debates and interviews on a wide range of subjects from as many different places as we can manage.